Carlisle United have parted company with manager John Ward by mutual consent after 13 months in charge. Ward, 57, leaves Brunton Park following a run of nine defeats in their last 10 League One games, the latest being Saturday's 3-0 defeat by Stockport. He led the Cumbrians to the League One play-offs last season, where they lost 3-2 on aggregate to Leeds United in the semi-finals. Assistant manager Greg Abbott has been put in caretaker charge of the side. Pressure had been building on Ward since the tail-end of last season when Carlisle won just two of their last 10 games, despite making the play-offs. Carlisle then started this season well and won four of their first five games to go second in the table before defeat at Scunthorpe signalled the beginning of their disastrous run. However the board had remained supportive of the manager right up to Saturday's defeat, indeed stating last Thursday that they backed Ward and his team to recover from the slump. "Carlisle United are a club that has been through too many crises over the last decade or two but we remain confident that the current personnel at Brunton Park can lead us out of the present situation," the club's official statement read. Ward took the reins at Carlisle after steering Cheltenham Town into League One and then securing them safety the following season. 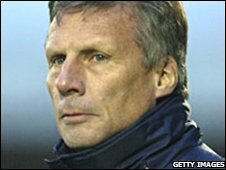 Prior to that appointment Ward had managed York City, Bristol City, Bristol Rovers and had a spell as caretaker manager at Wolverhampton Wanderers. The Cumbrians are currently 20th in the League One table, just one point above the relegation zone.